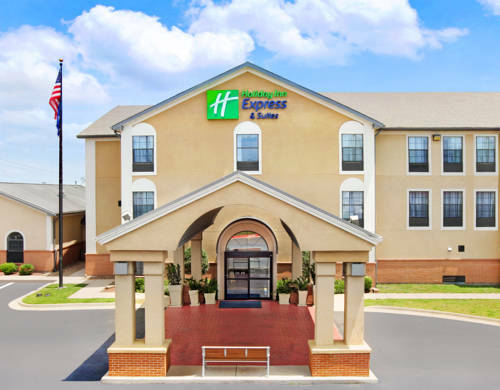 Stay at Our Hotel's Property in North Little Rock, ARSituated in the bustling and beautiful capital of Arkansas, the Holiday Inn Express North Little Rock hotel offers comfort and convenience. We have amenities like free Wi-Fi access and are near I-40 and I-30, making it easy to travel around Little Rock, AR.Our hotel's business guests are happy to find out that we're just a short drive from Georgia-Pacific, UPS and Remington Arms. We're also close to Camp Robinson, Little Rock Air Force Base, and Burns Park. Our hotel's event room is available, as well, in case you need to host a meeting with clients or coworkers.While you're here, make time to get acquainted with this exciting city. Take a stroll through the energetic River Market, or spend the day browsing the exhibits at the Central High Museum and Visitor's Center. At night, be sure to catch a performance at the Verizon Arena, and don't forget the William J. Clinton Presidential Library.After a day of meetings or sightseeing, head back to North Little Rock, Arkansas where our hotel's patrons enjoy unwinding in the heated indoor pool. If you choose to stay with us, you'll enjoy access to the on-site Fitness Center, as well as a complimentary, hot breakfast each morning featuring made to order pancakes, cinnamon rolls, and so much more. Call today and make reservations to "Stay Smart" in Little Rock! Located less than a mile from us McCain Mall is quick and easy to get to. With great stores like Dillards, Charlotte Russe, Buckle, Old Navy and many more. Also located inside the mall is the new state of the art Regal Theater. Located less than a Mile from the hotel, Barnes & Noble is a great stop if you are in need of a new book, music, movies or gifts. Barnes & Noble also serves Starbucks Coffee. Located less than a mile, Walmart is a great one stop shop for any need. - Little Rock Conv. Ctr. Seasonal water park open 7 days a week with food and bevaerage. This is a great location for family events of all ages. ~4 miles from North Little Rock.